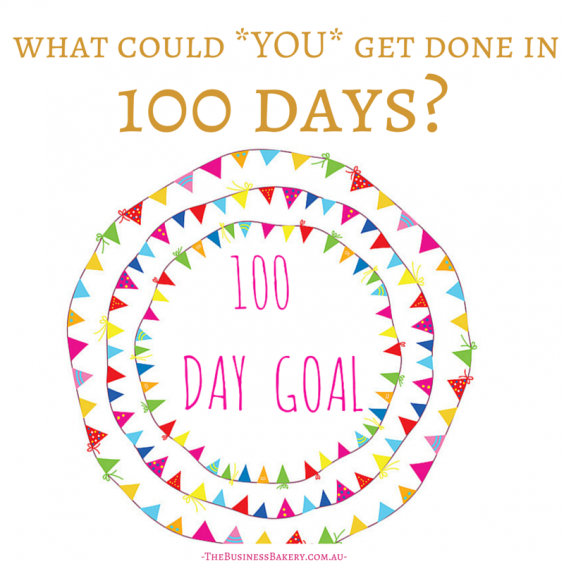 The 100 Day Goal – What could YOU get done in 100 Days? Oh gosh. It’s so hard to get big or new things done when you run a small business isn’t it?! With so much on the daily to-do list there just doesn’t seem time to fit “other” stuff in. How can you ramp up your business when you’re already super- busy? When are you going to get that new website done? How can you fit more marketing in? When are you going to set up your online shop? How are you going to start blogging? Gah! Where does time go! The good news is that there *IS* a way to get this stuff done! It’s called the 100 Day Goal and it’s totally the BEST way to make important business-y progress. Plus it’s super-doable! Want to know more?! The idea of the 100 Day Goal is super-simple. Set yourself a goal to reach in the next 100 Days and then do something every day towards that goal. Easy, yes?! In practise it’s a wee bit more tricky. You need to have a “good” goal and some tricks in place to make it easy to do ‘something every day’. More on that in a minute. First though, why 100 days? You might not know this, but 100 days really is the BEST length of time to work on a goal! Longer than that and you’ll have no urgency to get going; shorter and there’s not enough time to accomplish something big. 100 days is the Goldilocks of Goals. It’s just right! 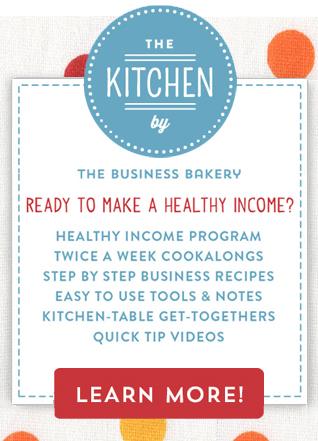 We’ve been running the 100 Day Goal with The Business Bakery for over a year now and more than 1500 people have done it with us (You can too! It’s Free! Just pop your details in here!). What we’ve learned is that it’s super-important to have the right goal! In fact 87% of the 100 Day Goalers who didn’t achieve their goal said that they thought it was because they hadn’t picked a “good” goal. Here are some tips for picking a good goal. 1. Pick ONE thing. A single goal is better than multiple goals. It’s all about focus! 2. Really WANT it. Make your goal something YOU desperately want to achieve. So not something you think you should aim for but something you really totally WANT to accomplish. 3. Decide on DOABLE. Big stretch goals are great but let’s get real here. You’re busy, you have a business to run. What’s really doable?! Reaching a small goal will motivate you much more than missing a big goal. 4. Be super-SPECIFIC. You need to know what finished looks like! Exactly! So if your goal is. say, to revamp your website, what does that look like exactly?! I like number goals (like a sales target) because I know exactly what that looks like! 5. Make it MEASURABLE. There’s nothing like seeing progress to keep you going so pick a goal that you can measure (each day if poss) and you’ll feel much more inclined to persevere! Making it easy to take action EVERY day! The 100 Day Goal works best when you do at least one small action towards it every day. Partly ‘cos “Dripping water wears away a stone”, but also because doing a small action every day turns the 100 Day Goal into a habit. And when something’s a habit it becomes a breeze to do. This sounds easy but it’s amazing how tricky we actually find it! Often we get stuck on what actions we should do (especially when we’re short on time it’s hard to think clearly on what’s the best next step to take). So here are some practical tips to help you take action EVERY day. 4. Do your 100 Day Goal ‘Action” first thing in the morning. This isn’t always easy to do but when you do your goal “Action” first thing you won’t run out of time to do it! 6. Join a buddy group. 100 Days is a l-o-n-g time to stay motivated. Most of us feel pretty excited at the beginning but sheesh it’s a bit of a slog! Joining a buddy group is a great idea to help keep you going. We’ve got a super-nice Facebook group that does just THAT! Fancy joining us? Details with the 100 Day Goal Workbook here. 100 day is a l-o-n-g time so you might need some regular doses of motivation along the way. Here are three things that always help! Isn’t it gorgeous? The idea is you colour in a swirl for each action or little progress you make. 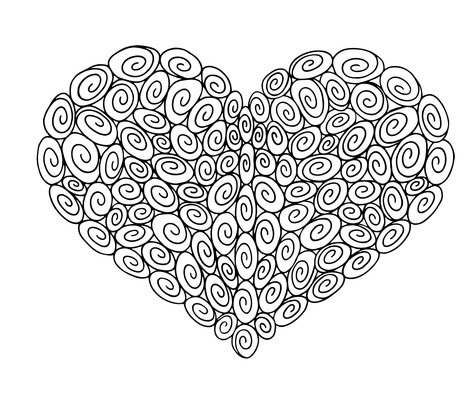 This one has 100 swirls – one for each day or for each 1% of your goal that you get done! Fancy getting one too?! There are lots of different designs (see them here) and the lovely Amy at “Map Your Progress” will give you 10% off all orders above $50 if you use the special code BusinessBakery at the checkout! 3. Keeping an eye on your goal. You’ll see in the printables that we suggest you write your goal down every day! Yup! It helps to remind you why you’re doing this! You can also write your goal up on the wall by your workspace or make a gorgeous visual to look at! We’re starting the 100 Day Goal with The Business Bakery on 1 January. Fancy joining us? You get the 100 Day Goal Workbook, cute printable Master Action Lists, Weekly Action Lists, 100 Day Journal template (which you can use as your journal) AND you get to join our little Facebook group, full of people like you, doing the 100 Day Goal PLUS you get a sweet daily email reminding you to write your journal and telling you how many days you’ve done! And it’s all FREE! If you like the sound of this just pop your details in here. Can you do something for me? Think back to 1 May. What was different about your business then to how it is now? Have you got a new website? Are your daily sales higher? Have you got a new product? Do you have new regular customers? Are you making more money? 1 May was 100 days ago and for many of us our businesses are pretty much the same now as they were back then. But for some of our 100 Day Goal-ers, things are very different! Why? Well they set a goal back on 1 May, took a little action on it every day for 100 days and -oh my -they nailed it! Fancy giving it a go? !